A Magazine Devoted to the Problems of Humanity. Atascadero, CA. 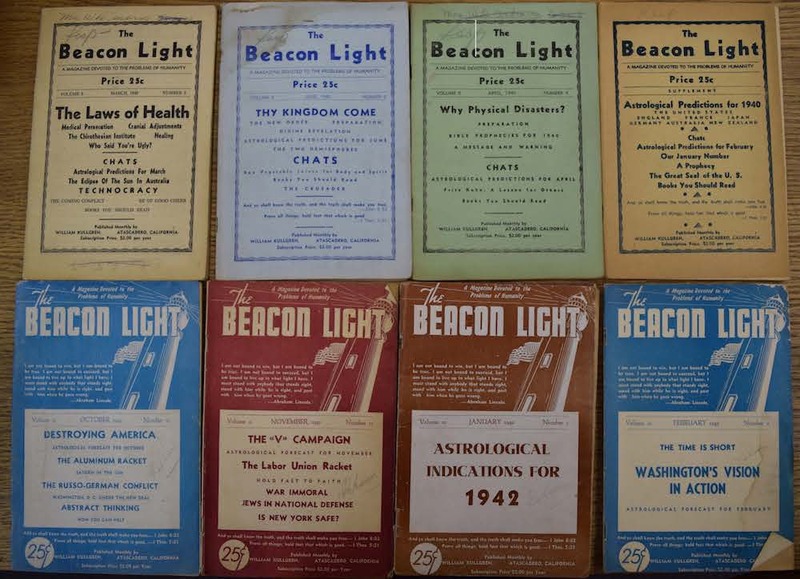 Publisher: Beacon Light Ministry. Editor: William Ernest Kullgren, owner and founder. 1/1, 1933-1960. $2.00-5.00 a year, 48 pp. The journal may have ceased publication in 1942 when Kullgren was indicted and was then revived in 1947 with the addition of "Herald" to its title, based on the format of a private newsletter Kullgren circulated as early as 1943. Kullgren (1885-1966), whose family name was Pearn (an earlier attempt to Anglicize the family's Swedish name of Kullgren/Collgren), was an English astrologer, British-Israelite, health-food faddist, and distributor of the work of Nesta Webster. On his draft registration form from World War I he listed as his nearest relative/friend as John Hazelrigg, the astrologer, which may explain his presence and work in America. He was a member of William Dudley Pelley's Silver Shirts and in 1942 was barred from the mails and then, in 1943, was charged with sedition, though never tried. His journal was earlier, in 1940, barred from the mails in Canada because of his prognostications on the fate of the British Empire bereft of its Christian heritage. He is described as a Christian Crusader and anti-Semite, and the journal was said to have had astrological predictions deemed supportive of Nazi views. He was a member for a time of the Theosophical Temple of the People and long associated himself with Max Heindel's Rosicrucians. At one point he predicted that Los Angeles was about to be destroyed by "celestial force" and urged a diet of raw kelp to prepare. 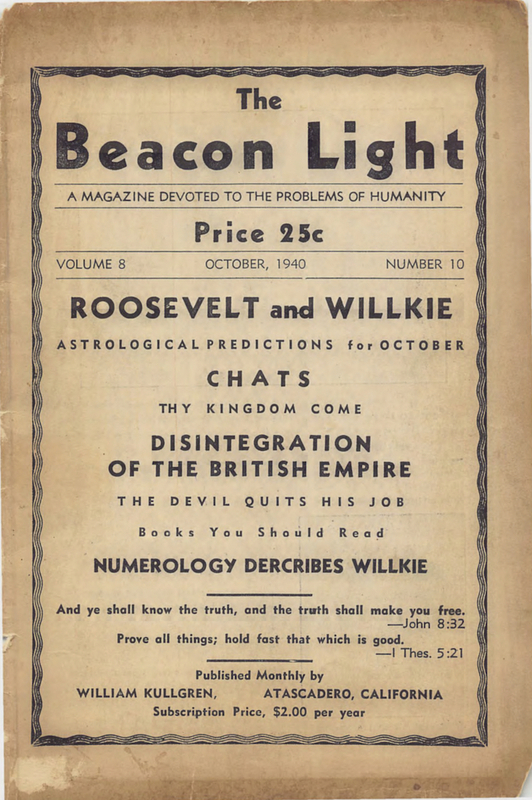 Over the years, the journal also delved into the prophecies contained in the Great Pyramid and, eventually, into UFOs. Kullgren also published Messages of Light Given in His Name through Margo, the Hope of World (1949). His later work, Messages from Higher Planes (c. 1960), features the messages to earth of beings from outer space, including a mushroom eater from the planet Binka, Napoleon, and Nepto of Neptune, and (astral) traveling on the Christ Ray. Contributions by Harry J. Gardener, DeWitt B. Lucas, et al., and advertisements for the books Kullgren carried by Gardener, Heindel, Lucas, Dr. and Mrs. F. Homer Curtiss, John H. Dequer, Brother XII, Gerald B. Winrod, Paul Foster Case, Nesta H. Webster, Gayelord Hauser, Hiram E. Butler, Elbert Benjamine, and others. In 1942 the journal was said to have had 900 subscribers. Kullgren also published, beginning in the 1930s, the Forum, which seems to have been devoted to hotel management and politics, and also published the monthly America Speaks during World War II (no. 17 was April 1944). University of California, Santa Barbara and Davis; Michigan State University; University of Kansas; University of Iowa, etc.